Disclaimer: I chose to buy this book and review it on my own. This review has NOT been paid for, but I did receive a 25% commission for purchasing the book through my Usborne Books & More Independent Consultant business. Shadows of the Master is the first in a series about a young girl desperate to be a trader like her father. Traders are sailors that explore different lands and trade the goods found there. Unfortunately for Britta she cannot reveal who her famous trader father was because he disgraced himself searching for a mysterious object. 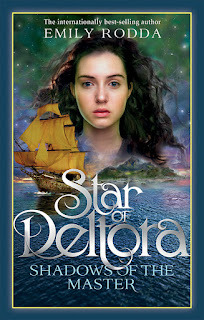 Britta has been living in hiding ever since, but when she has a once in a lifetime opportunity to compete for a position on her father's old ship, she knows she has to go for it. I really enjoyed this quick fantasy novel. Britta is strong and brave, but not perfect. At times she is completely oblivious to things happening right in front of her. I was intrigued by the whole trading lifestyle, as well as the mysterious magical elements of the King in the Shadows watching her. Full of adventure and a bit of suspense, Shadows of the Master was enough to entertain both my nine year old daughter and me. This book is the first in a sequel series to Cinda Williams Chima's earlier series, The Seven Realms. 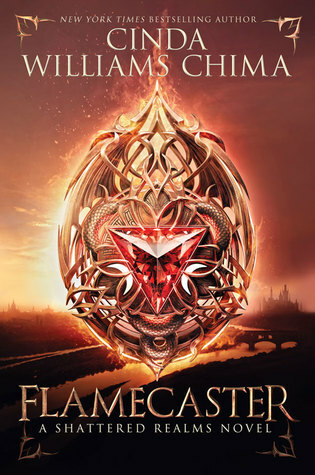 I enjoyed that series immensely and Flamecaster was no different. This one takes place many years later and features the son of Han and Raisa, Ash. When a series of murders puts the royal family in danger, Ash escapes to the dangerous rival country, Arden. He gets close enough to the man behind the murders, the treacherous King, but can the healer Ash take a life instead of save one? At the same time, a young girl Jenna, is hunted by the King's people because of a mysterious mark on her back. Ash and Jenna are thrown together in their quest to overcome the cruel King. I love this Universe and Chima has a way of making you care for characters. As a fan of the first series, the opening chapters were heartbreaking for me. I'm not exaggerating when I say I had a big ol' lump in my throat. While this series can stand alone--there's enough background information to understand the conflict--knowledge of the first series will enhance enjoyment of this one. As well as increase the sucker punch feel. Highly recommend! Traveler is the second book in an interesting fantasy trilogy about a group of people who can manipulate time. The first book, Seeker, set the stage for the conflict. This second book continues where it left off. I read it half a year ago (yes, I am just reviewing it now, yes, I need to schedule my life better) and while some of the details are fuzzy as I try now to write the review, most of the story has stayed with me--which is one of my benchmarks for a good book. Quin Kincaid is a strong heroine, battling her controlling evil father, her controlling revenge-seeking ex-boyfriend, and dealing with her new relationship with Shinobu. There's more history of the Seeker families, as well as information on the Dreads. It's absolutely necessary to read the first book in the series to understand any of what is going on, although there are flashbacks and reminders to events from Seeker. Once again, I found myself drawn to the Young Dread's story and I'm excited to discover that there is a novella all about her! I'm looking forward to reading that as well as the conclusion to the trilogy.